For the Love of Movies: The Story of American Film Criticism is the first documentary to dramatize the rich saga of American movie reviewing. 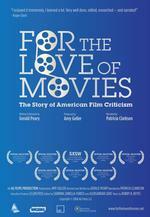 Directed by Boston Phoenix critic, Gerald Peary, For the Love of Movies offers an insider’s view of the critics’ profession, with commentary from America’s best-regarded reviewers, Roger Ebert (The Chicago Sun-Times), A.O. Scott (The New York Times), Lisa Schwarzbaum (Entertainment Weekly), Kenneth Turan (The Los Angeles Times). We also hear from young, articulate, Internet voices, including Harry Knowles (ainitcoolnews.com) and Karina Longworth (spout.com). Their stories are entertaining, humorous, and personal. Those who hear them may gain new respect for the film critic profession, knowing the faces and voices, and also the history. From the raw beginnings of criticism before The Birth of a Nation to the incendiary Pauline Kael-Andrew Sarris debates of the 1960s and 70s to the battle today between youthful on-liners and the print establishment, this documentary tells all. With narration by Patricia Clarkson.